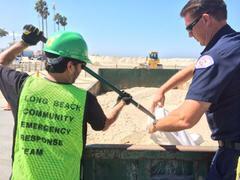 City crews have taken significant efforts to prepare for a storm surge on the Long Beach Peninsula from Hurricane Marie located in the Eastern Pacific Ocean. A coordinated multi-department response will continue throughout the duration of the event. Sand berms have been fortified. Additional staff and equipment have been in place closely monitoring the situation. The City is making sand bags available to Peninsula residents. Bins of sand and empty bags are available at Ocean Boulevard and 72nd Place and at the Claremont lot at Ocean Boulevard and Claremont. Residents must bring their own shovels and we ask that residents limit their allotment to 10 sandbags per visit. Currently there are no impacts from the first anticipated surge event. The berms remain intact and there are no reports of flooding or other problems. The next anticipated surge event is forecasted for tomorrow, August 27, at 6:00 PM.